Finding a GOOD chess coach is also a huge problem. How many chess teachers do you know who can say: “I know exactly how to get progress in chess and I can guarantee it to you.”?The most popular answer is “Zero”. “Pointless knowledge”, which doesn’t give you any concrete results, is the biggest problem for all the chess players! During my chess career as a player and as a coach I have thought about an effective way of learning all the time (you can read more about it here: About me). That’s why I decided to develop a chess course “The Grandmaster’s secrets”. With pride I can say that this course will give you only the concrete skills (no more pointless knowledge!). Lesson-1.1: “How to play the game (strategy)”. Lesson-1.2: “How to play the game (tactics)”. “How to prepare for the game”. Lesson-4: “How to Learn Chess”. All chess players learn chess, but some players play much better than others. What does this mean? It means that many players’ learning is ineffective. In this lesson I will tell you the secrets of the Grandmaster’s training. Chess course “The Grandmaster’s secrets” also contains a practical part. The practical part of the course contains 200 special games and tasks, which will help you put course’s ideas into practice. You will also get the program for self-trainings. This detailed guide explains what and how you should do to increase your chess power. The program is designed for several months of training (2-4 depending on how much time you spend on chess per day) After the completion of all the tasks in the practical part of the course you will really get the practical skills necessary to become a Grandmaster! Besides, it’s been proven a long time ago that text information is digested much worse than the same information in video-format since people remember only 10% of what they have read, 20% of what they have heard and 70% of what they participated in. Thus, the video-format involves all channels of perception and provides peak efficiency of training. The graphic menu of the course (screenshot). While studying the course, besides a chessboard, you will see text presentations which will help you to systematize and learn the course’s materials better. 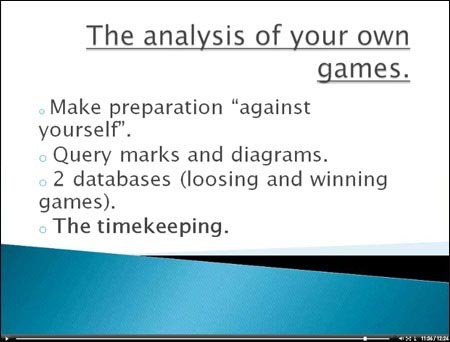 Fragment of lesson 1.2: “How to play the game”(screenshot). Fragment of lesson 4: “How to learn chess”(screenshot). Chess is becoming more and more popular. Accordingly, the quantity of strong players has recently increased considerably. The weak opponent can be beaten, using well-known chess knowledge. For a victory over a strong opponent it is necessary to possess unique and effective skills in addition. You will get all the programs, necessary for using of the course. So you will definitely be able to open the course and use it properly. The course works under Windows platform, and on Mac computers. The duration of the video lessons is 120 minutes. Why not 12000 minutes? Because I am not going to give you another portion of pointless knowledge. One philosopher said: “If something is too complicated it should be wrong”. My course contains only the concrete practical recommendations and gives you the concrete guide for successful training and play. It is simple and effective! 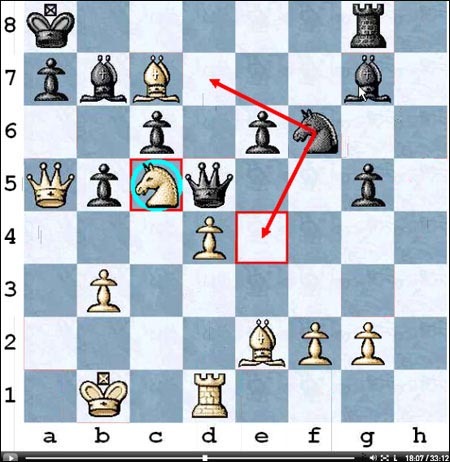 You will get the text version of every video lesson and *.pgn file (chess games file) also. If you like to read more than watch the video – you can do it easily. Even if English is not your native language, you will understand everything clearly. You will hear my voice, watch the video presentation, read the text and you can simply use a dictionary if needed. You will get your special link for downloading the course after purchasing. So you DON’T need to pay an extra shipping fee and wait for several weeks to get the course. That’s why the customers receive the course immediately after the purchase. The size of the whole course is approximately 50Mb, so you can download it quite quickly (it depends on your internet connection, but it should be less than 15 minutes). If you have any sudden technical problems – contact me and I will help. 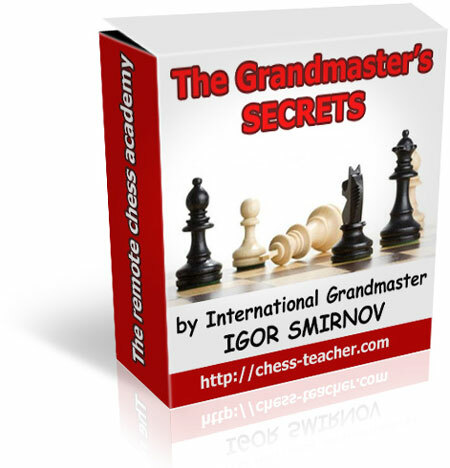 Buy the course “The Grandmaster’s Secrets” now and study it seriously. Learn the video lessons and complete all of the practical part tasks (following the corresponding instructions). Then apply these skills in your practical games. There is no risk for you at all. I am giving you the full guarantee of your success. If you don’t get a chess progress, I will refund you the whole amount. Probably you are wondering why I am so presuming? Well, I have a good reasons, because I receive a lot of e-mails (and other feedback) from my customers daily. So I don’t supposesomething, I KNOW that “The Grandmaster’s secrets” will provide your good progress. 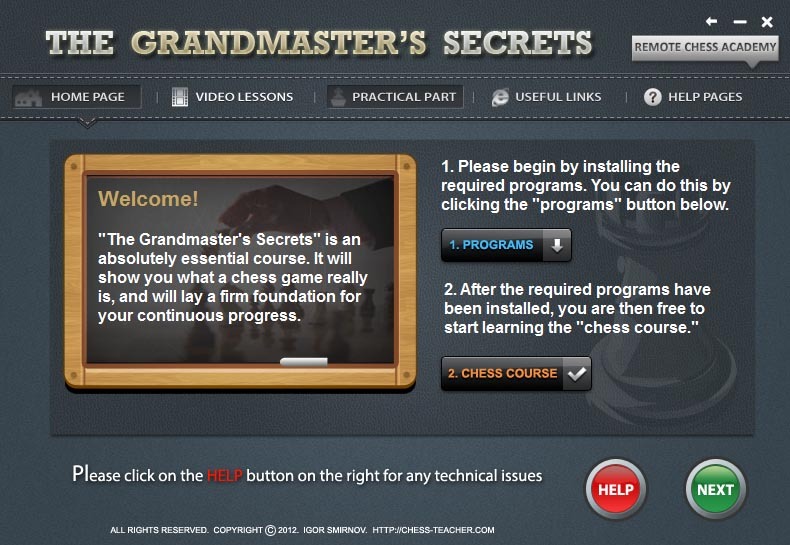 “The Grandmaster’s Secrets”is a Remote Chess Academy! “The Grandmaster’s secrets” is more than a simple course. You will get the full guide of what and how exactly you should train to become a strong player and receive all the materials necessary for your trainings and detailed instructions on how to do them. So really it is a remote chess academy! The text versions of video lessons (for printing). 200 special games and tasks (a practical part). These 200 special games are presented in *.pgn format (for chess programs) and in the text format also (for printing). The complete and clear program for several months of your independent training, which will bring you great progress. THE NOTE: If you wish to reach big goals – you should train hard. I offer you the detailed instruction, which needs to be carried out to bring you the guaranteed progress. But it needs to be carried out! If you expect to receive progress by simply having familiarized with course’s materials – I do not advise you to buy it! The course “The Grandmaster’s secrets” gives you the program for independent training for 2-3 months, and all the materials necessary to perform it. I have spent several months to prepare all these materials for you. What price of such chess course should be appropriate? The usual cost of a training with a professional coach (and GM) is 40-100$ per hour. Even if you take only 2 lessons weekly during 3 months – you will pay 960-2400$.The majority of books, unfortunately, gives another portion of useless knowledge which does not give REAL progress even though each book costs 15-150$. The price for the full course “The Grandmaster’s secrets” is only: 57 dollars It is the price for 60-90 days of a train under the direction of an experienced Grandmaster and a chess coach. In fact it costs only 57usd/75days (average)=70 cents per day. Chess course: “The Grandmaster’s Secrets”. Requirements: Windows platform, Mac computers. First, click the order button below. Then choose the method of payment on the next web-page. Grab it now and start your new way forward!